I am so excited about the glasses I just learned about. They are called Systems of Sight. A friend of a friend is waiting for his glasses. I will be sure to let you know how they work for him. According to the video I just watched, the glasses can be helpful for those with macular degeneration. They are not available to buy without a consultation and only two locations currently offer them. Plus, they are expensive (close to $3,000 dollars). Medicare doesn’t cover them. The glasses remind me of Beecher Binoculars. Except with the Systems of Sight, you can walk around while wearing them. Like the binoculars, the glasses use a system of redirecting images so the wearer can look straight ahead. The home office is Orlando, FL. Phone numbers are 407-857-1864 or toll free 800-435-7706. The web site is www.systemsofsight.com. Seeing faces, including your own in a mirror (for make-up and grooming). Hobbies like knitting, cards, and working puzzles. 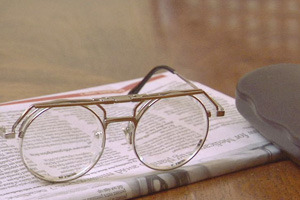 Readers, have you heard about these glasses? Know anyone who has them? If so, please go to the “contact me” page and tell us what you have heard. I will pass along your comments, without your name.